Zelo Street has previously told of the case of Raheem “call me Ray” Kassam, recently in the employ of UKIP leader Nigel “Thirsty” Farage”, whose Wikipedia entry was removed after it was decided he was not important enough to warrant it. It was with this in mind that the page telling of the career of one Charles Thomson passed before my inspection. Who he? 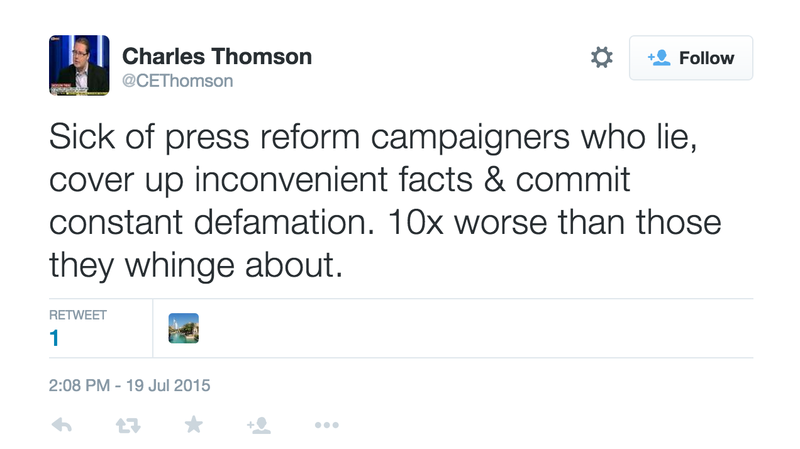 Well, exactly: Thomson is a freelance journalist. And, so what? There are plenty of those around right now. But Thomson’s Wikipedia entry was on the kind of scale that dwarfs other hacks. The entries (for instance) for the odious Quentin Letts (let’s not), the Telegraph’s Charles Moore, or Simon Jenkins, paled into insignificance by comparison. After a perusal of this magnum opus, the thought occurred that this was little more than using Wikipedia to advertise a CV. Did Thomson actually warrant a Wikipedia entry? Having your own blog at the HuffPo hardly qualifies for one, and neither does an interest in Michael Jackson and James Brown. There appeared to be some duplication of material, especially telling anyone who stopped by that Thomson had secured a number of awards - well, three, anyway. An inquiry - no names, no packdrill - was made of Wikipedia. And so it came to pass that Charles Thomson’s Wikipedia entry was stripped of much of its content. The section titled “Investigative” was removed completely: much of its content was duplicated elsewhere. 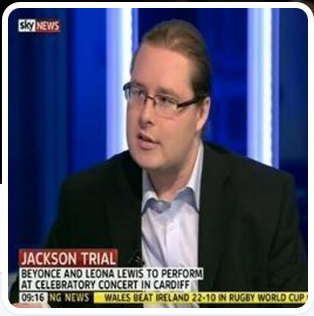 “Court Reporting”, as can be seen from the screen shots, was reduced in length considerably. There was significant reduction in the section on “Awards”. And then there were all those references. The roll call of references used for citations, which had stood at 75 entries, was whittled down to just 24. This was achieved, mainly, by stripping out references to Thomson’s own blog. Wikipedia clearly is not impressed by those whose justification for their overlong pages is down mainly to Because It Was Written By Himself Personally Now. And there is another matter that Wikipedia has not yet been asked to consider. As happened with Kassam - who, remember, has achieved some notoriety of late, garnering a number of media appearances in the wake of his departure from the service of the chief Kipper, including being interviewed by Emily Maitlis on Newsnight - there is still the question of whether Thomson is really important enough to have a Wikipedia page in the first place. He is, after all, hardly a household name. I must stress that there will be no communication from myself to Wikipedia on the subject, but anyone who considers that this relatively unknown hack does not warrant a Wikipedia page is free to contact administrators and make their case. After all, Wikipedia is supposed to be about people and events that are of some importance - not some kind of shop window in which to place an extended CV. But full marks to whoever authored that page for creativity. Someone, somewhere may find that useful. [UPDATE 1705 hours: Charles Thomson has taken the news of his Wikipedia diminution, and this blog post, particularly badly, and has made a number of allegations against me and others. 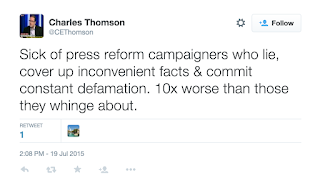 He particularly talks of "press reform campaigners who lie, cover up inconvenient facts & commit constant defamation". Then he makes a particularly unfortunate mistake. "They've removed reams of sourced facts from my Wiki page, then lied & defamed me by claiming I created/edited the page. I never have. Ever". Whoever has created and edited his Wikipedia page - and he has admitted providing the information for it - the removal of material from it was performed by a member of the Wikipedia OTRS team. This can be ascertained by checking the revision history of his page. The suggestion that I, or anyone else Charles Thomson calls a "press reform campaigner", had edited his page is untrue and defamatory. Exactly where that leaves him I will leave to others to conclude. He's just another far right neocon hack. 2) On what basis are you calling me a 'Walter Mitty'? What have I said about myself which you believe to be untrue? 3) On what basis is your follower describing me as 'far right'? What have I said which can be described as 'far right'? 4) The Wiki page was edited as a result of your followers complaining to Wiki, which you and your group of Twitter trolls incited them to do. Baselessly. All of the info removed was factual and sourced and the page has been rendered inaccurate as a result of the edit. Neither I, nor any group with which I may be associated, incited anyone to complain to Wikipedia prior to the edit of your page. Your claim is therefore untrue and defamatory. Why the edit was performed can be seen from a scan of the editing history. "but anyone who considers that this relatively unknown hack does not warrant a Wikipedia page is free to contact administrators and make their case"
That is unarguably an incitement. The Wikipedia edit was made BEFORE the blog was posted. Nowt gets past you, does it? Now stop wasting my time and run along. Tim, You're wasting your time with that dope. You made your point very well, which is why he has reacted.